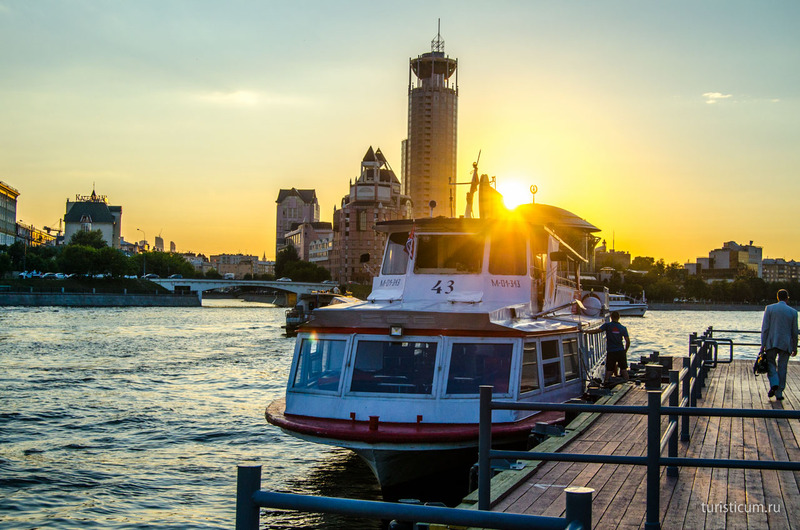 An excursion along the Moskva River (Moscow river) is one of the traditional ways to first taste the capital. 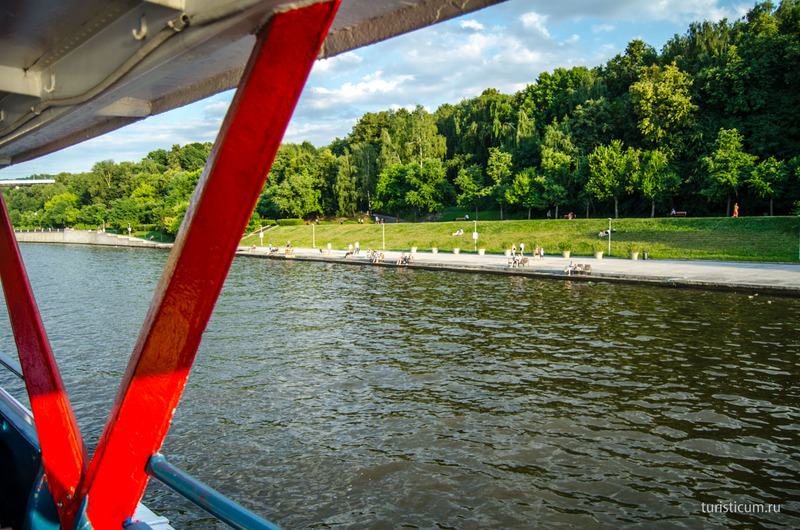 In addition there is also nothing more pleasant than to enjoy some cool fresh air onboard a small ship on a hot day, even if it is not your first impression of Moscow. 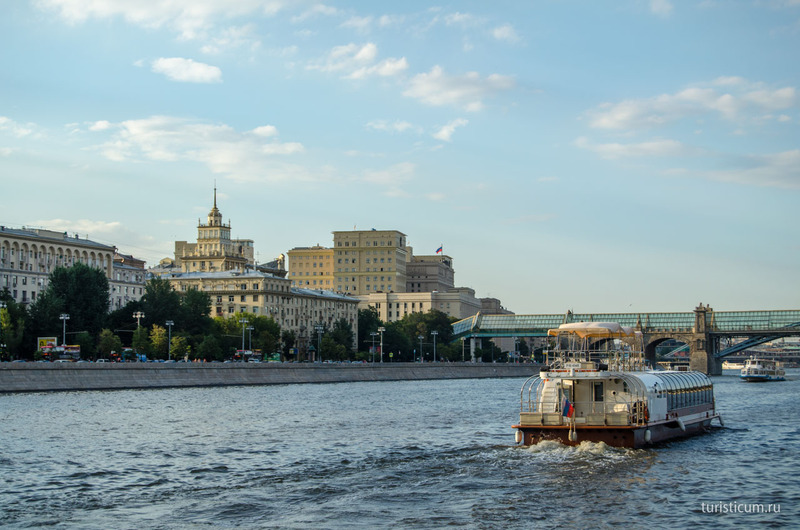 Such ships cruise along the river that flows in the very center of Moscow from the northwest to the southeast. 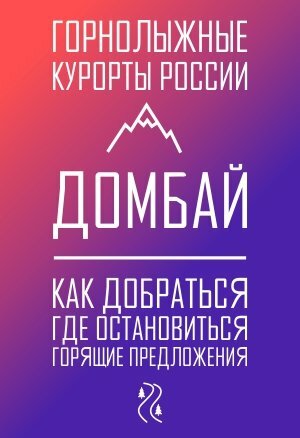 Moscow is literally the most touristic city in Russia. It is only Saint-Petersburg that can compete with it. 16.5 million tourists visited Moscow in 2015. 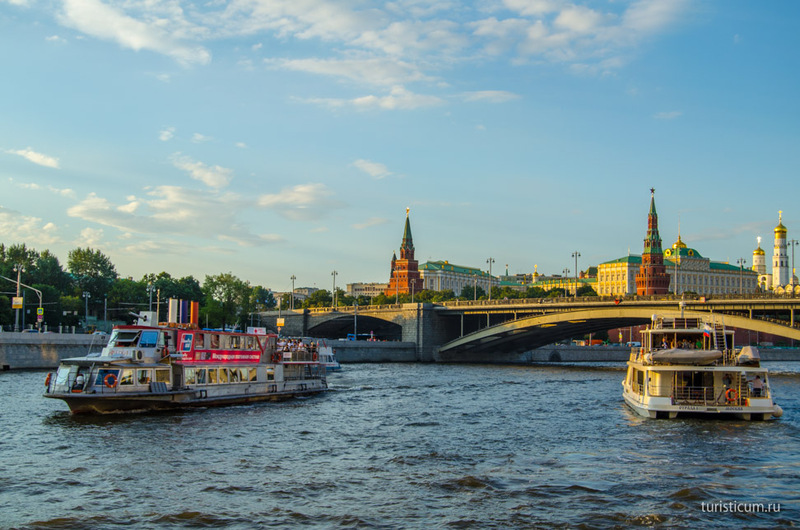 Compare the number with that of Saint-Petersburg with 6.5 million tourists for the same period. It is not only the state, but also private companies who profit from tourism and this is true for any touristic center in the world. It is not a secret that the amount of private business is growing proportionally with the amount of tourists. 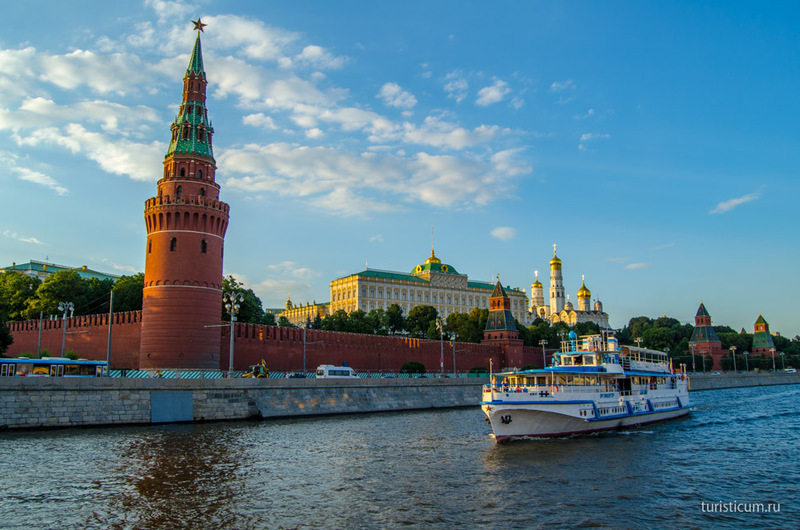 One can easily buy a highlight tour round Moscow either on foot, by bus or even by ship along the Moskva river. Apart from typical bus tours there are also two city routs round Moscow on the legendary double-deckers. A ticket for such a tour gives you a chance to ride along the city all the day long. You can also get off on the bus to walk and get on another bus later. Additional information about these tours is at the web-site of City Sightseeing. 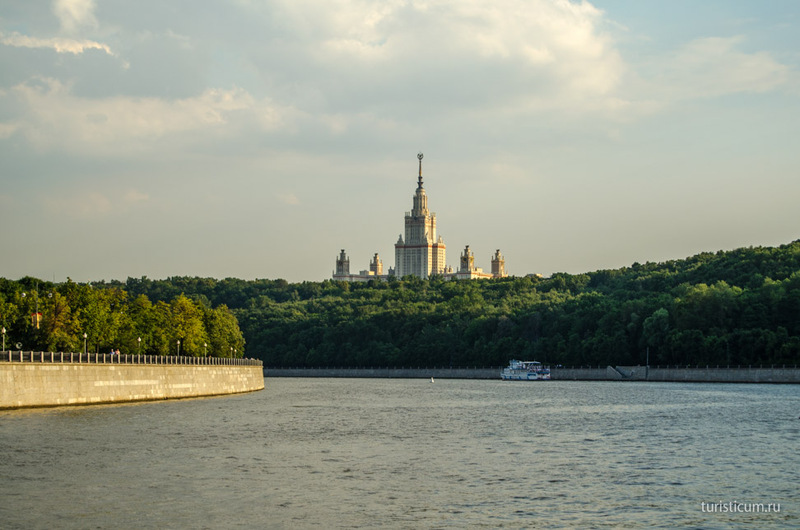 We decided to take a look at Moscow from the river. 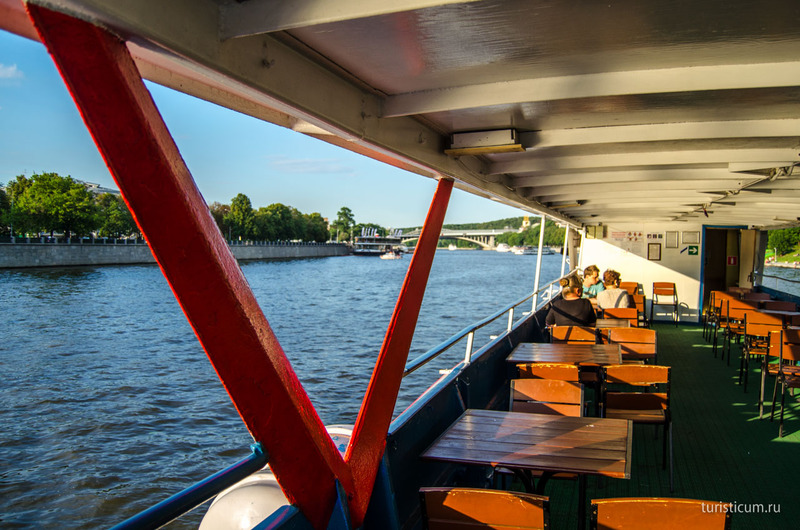 There are many different ways of travelling along the river including small ships, floating restaurants and even marriage ceremonies and parties onboard. There are also plenty of piers and routs. But the one we chose was the best possible, taking into consideration the time spent onboard and the amount of sightseeing covered. 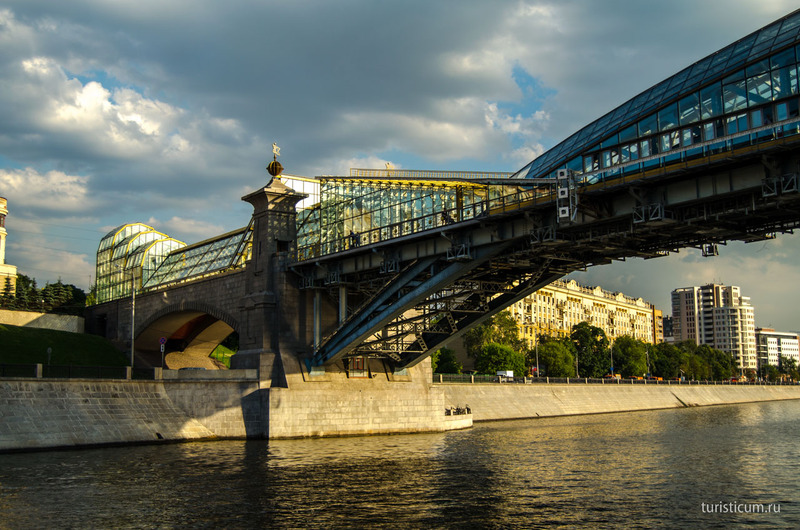 The easiest way to get to the Kievsky pier is by metro. “Kievskaya” metro station is on the Belt Line and it is not a problem at all to get there. 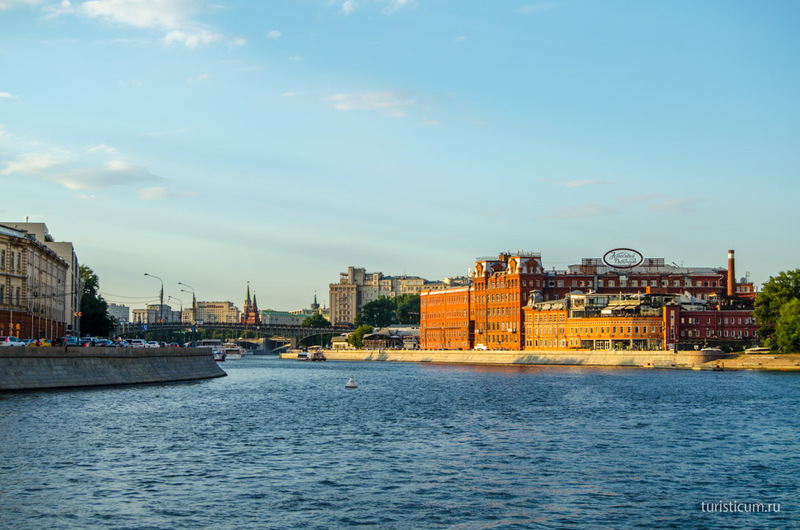 After the metro you pass the Europe Square and the Kievsky Garden Square to find yourself at the Moskva river embankment. Ships at the pier can serve as a mark for you. 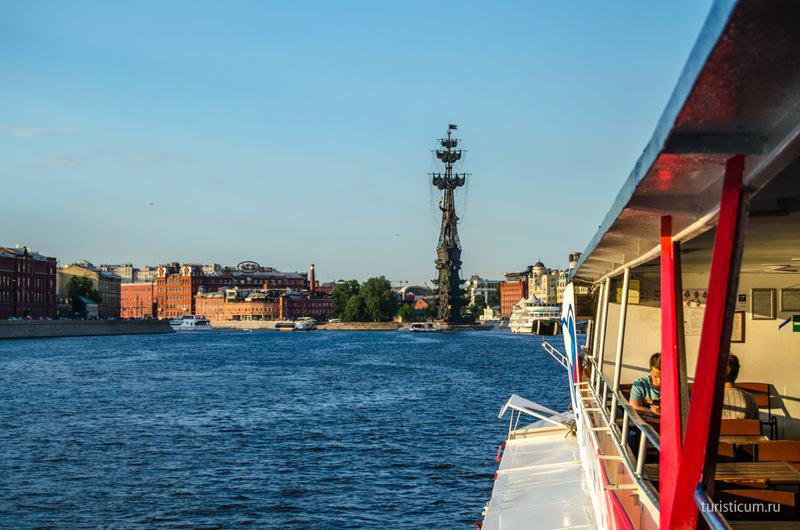 Ships sail along the Moskva river from the «Kievsky Rail Terminal» pier several times a day. Several routs are available here. They differ in length; can sail back and forth or in one direction only. We chose the route in one direction. 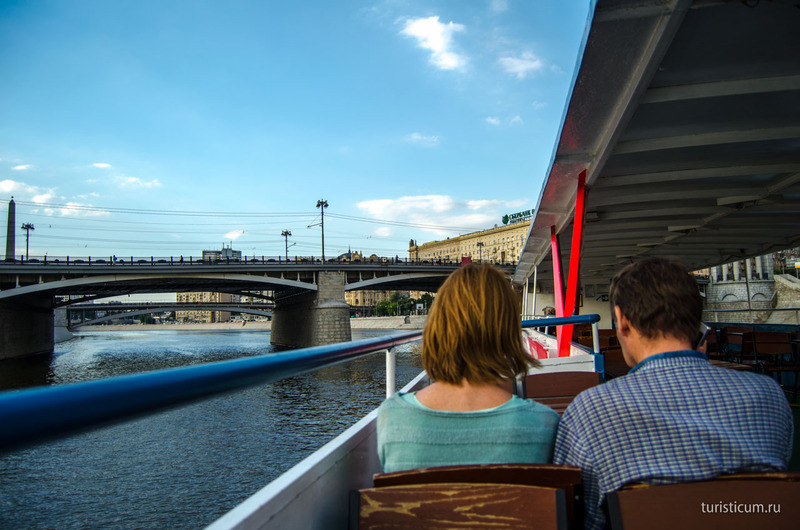 The excursion along the Moskva river lasted 90 minutes and cost 600 rubles per one person. The first sail is at 10.50 a.m., the last is at 8.10 p.m. the interval between sails is 40 minutes. So, we bought tickets and took the seats we liked. We had our sail on a Thursday evening and consequently there were only about twenty seats taken onboard. Anyway it is hard to say whether the situation is different at the weekends. Our ship “stepped” towards Borodinsky Bridge, turned around and settled on the mentioned course. The first bridge of those many that we were to pass was Bogdan Khmelnitsky Bridge. It is a pedestrian bridge with rolling stairs moving in both directions and this fact makes the bridge especially comfortable. Besides, there are both the glazed and the open parts on this bridge. 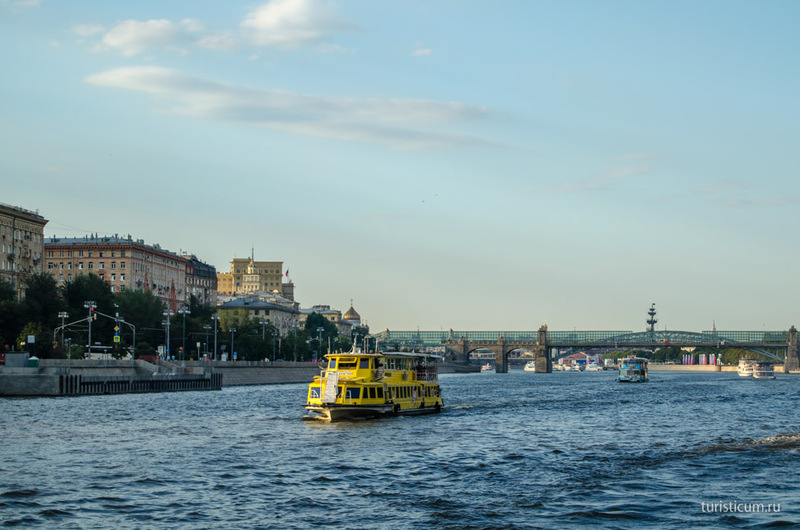 The last one is good to enjoy the vast of the Moskva river. This bridge will later become the initial point of our walking excursion round Moscow. There is Khamovniki District spread out right in front of us. 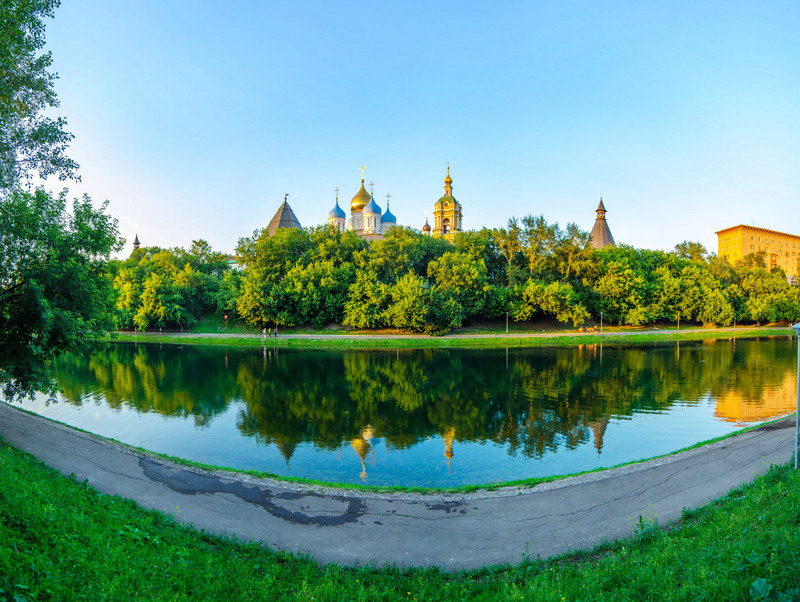 We can see Novodevichy Convent, and the tops of domes of (from the left to the right) Saved Transfiguration Church in Novodenichy Convent, Bell-tower and the Barlaam and Josaphat Cathedral in Novodenichy Convent, Smolensky Cathedral, dedicated to the icon Our Lady of Smolensk in Novodenichy Convent. There is a more comfortable ship sailing towards us. They usually serve lunch or supper on such ships. Another bridge that we pass by is Luzhnetsky (New Krasnoluzgsky) Bridge. Quite obvious that the old bridge should also exist somewhere. 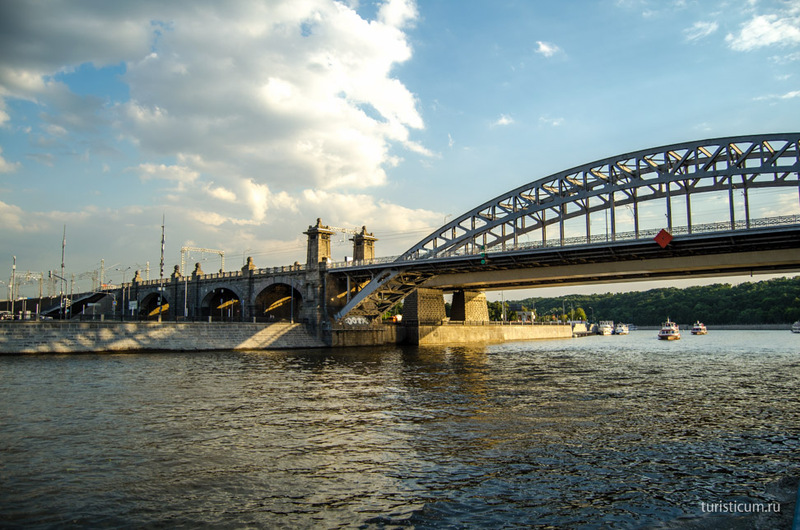 In fact the “old” Krasnoluzhsky Bridge has changed its location in 2000 and is now by Kievsky Rail Terminal (the first bridge we passed). It became pedestrian and received the name of Bogdan Khmelnitsky. A new rail bridge appeared at this place. 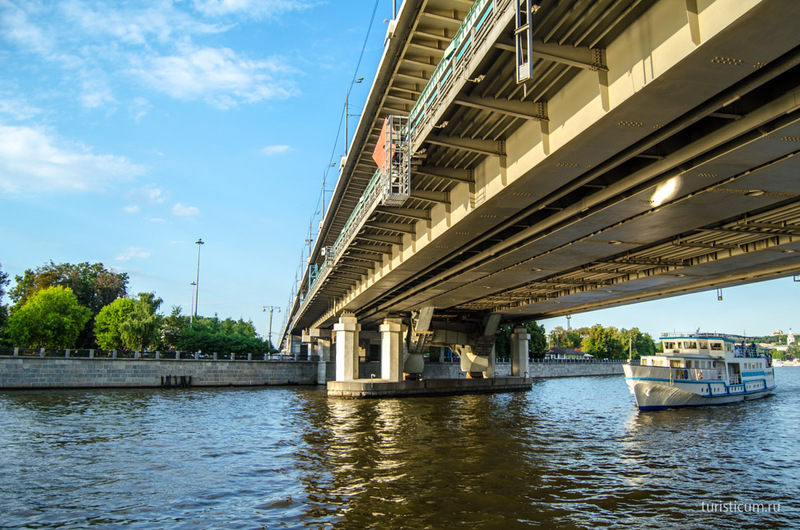 There is also Berezhkovsky Bridge nearby. The Third Traffic Ring passes through it. The Moskva river takes a sharp turn here, bends round Khamovniki District. 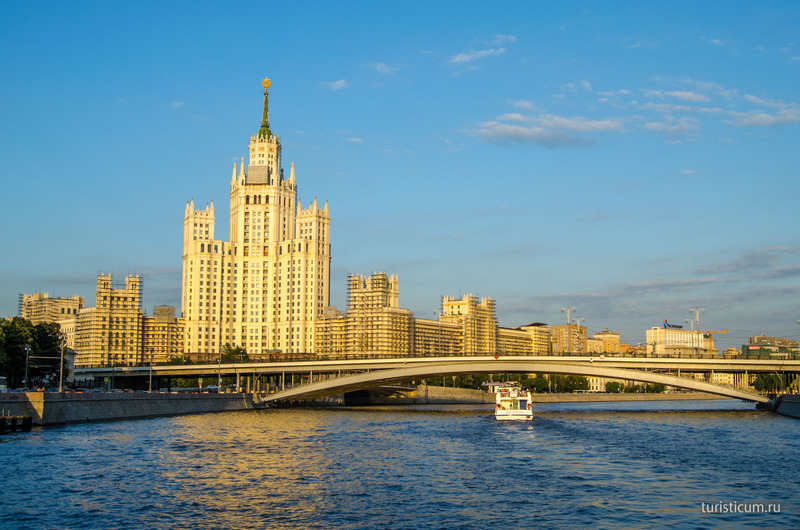 Our ship also turned opening the view of the main Stalin’s high-rise in Moscow – Lomonosov Moscow State University. Nature reserve Sparrow Hills spreads in front of the university as far as the river. 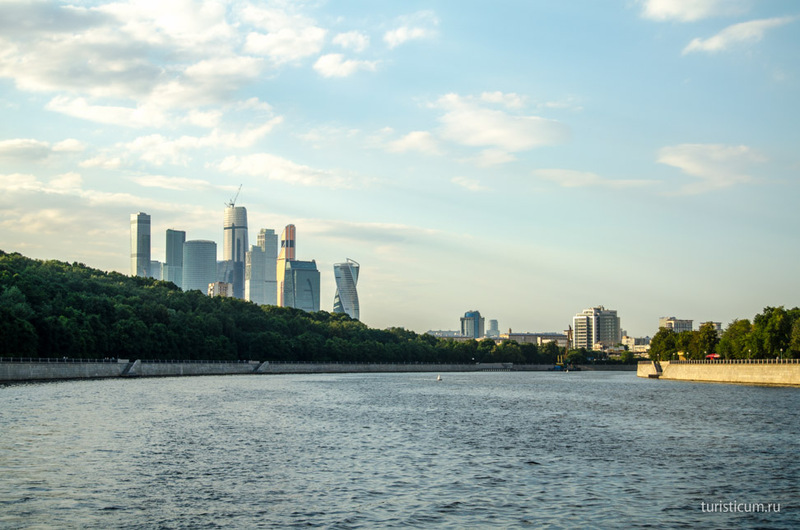 Behind our backs there is another beautiful view – not to Stalin’s empire style, but to the modern architecture of Moscow City business center. 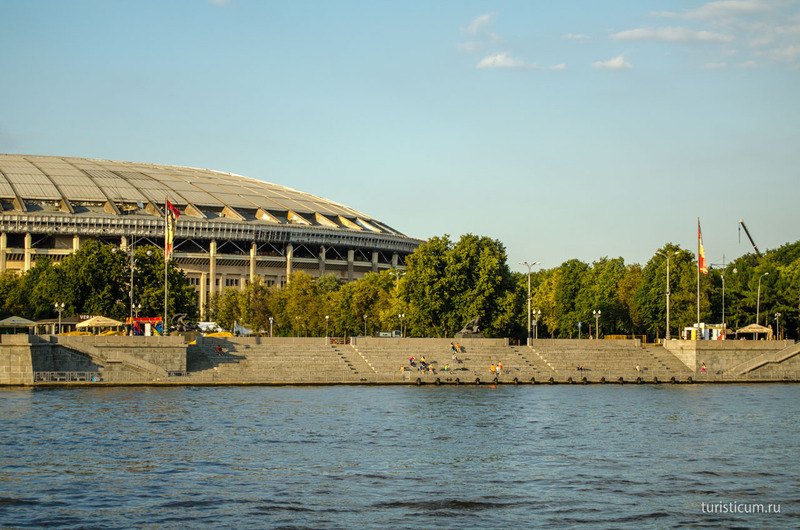 There is Luzhniki Olympic Complex on the left bank of the river in Khamovniki District. It is now under reconstruction preparing for the Football World Championship in 2018. 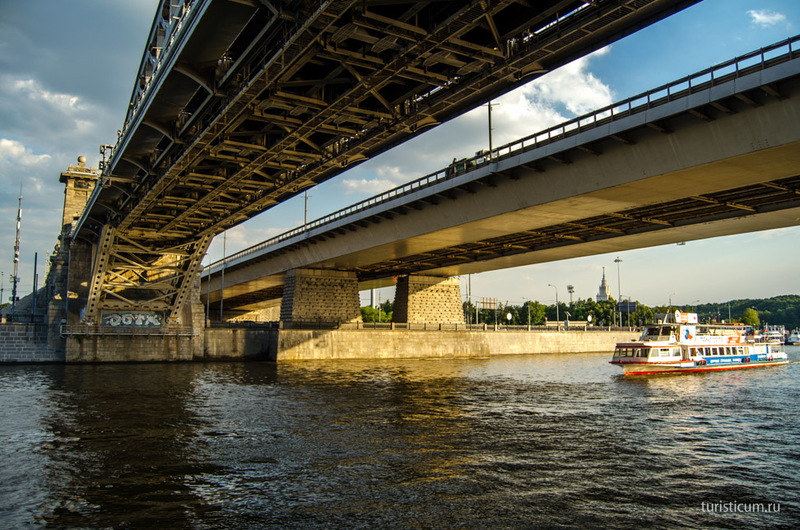 The next bridge is unusual – it is a metro bridge. This is “Sparrow Hills” metro station. The Central Committee of Russian Academy of Science (RAN) is right behind the bridge. It is a unique building. Its construction began in the end of the 60-s and lasted 20 years. The top of the building is decorated with a metal construction colored in gold. This construction caused the building to be called “golden brain”. 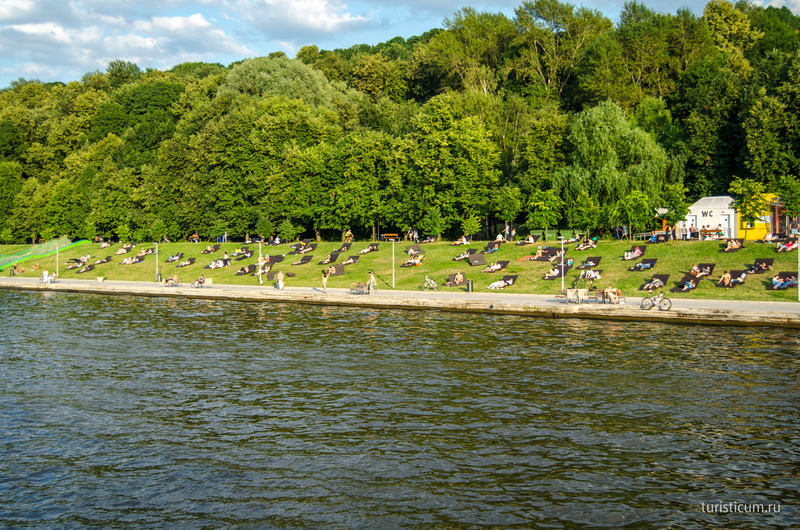 People on the Sparrow Hills are experts in relaxing and enjoying a sunny day sunbathing on the green hills. We sailed closer to the building of Russian Academy of Science and under the Third Traffic Ring again. 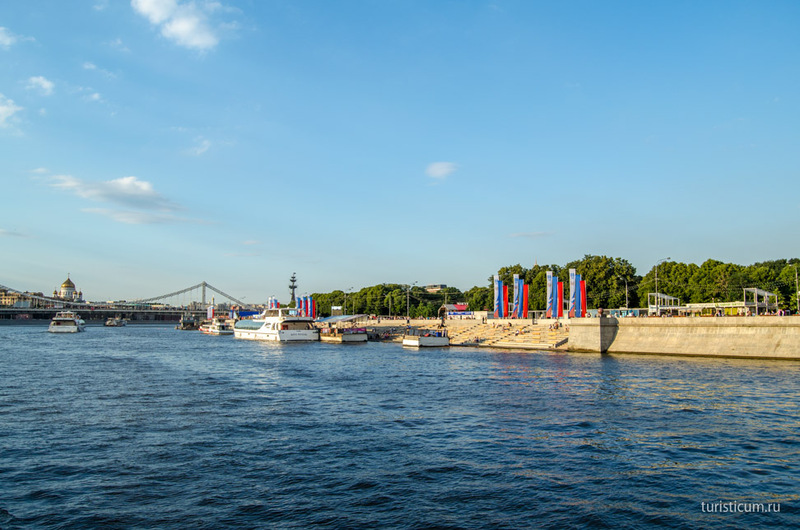 This time it crosses the river with Novoandreevsky Bridge. There is still Khamovniki District and its Frunzenskaya embankment on the left. 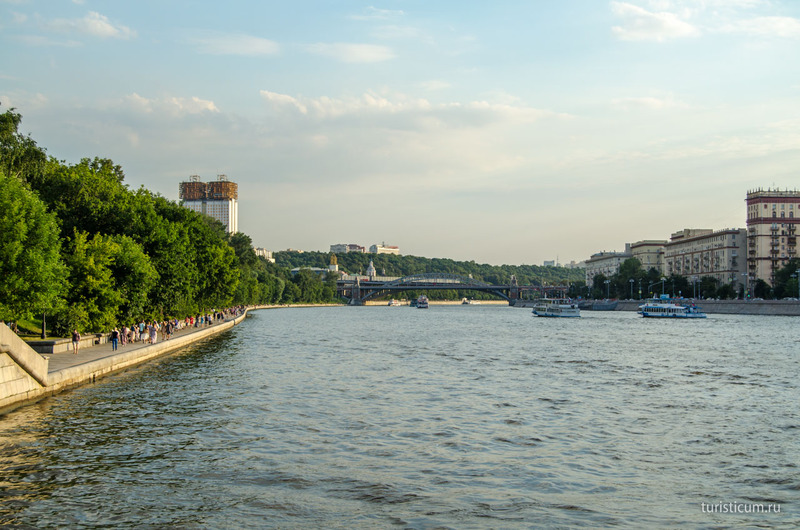 Pushkin Bridge in front of us nominally divides two parks – Neskuchny Garden and Gorky Park. 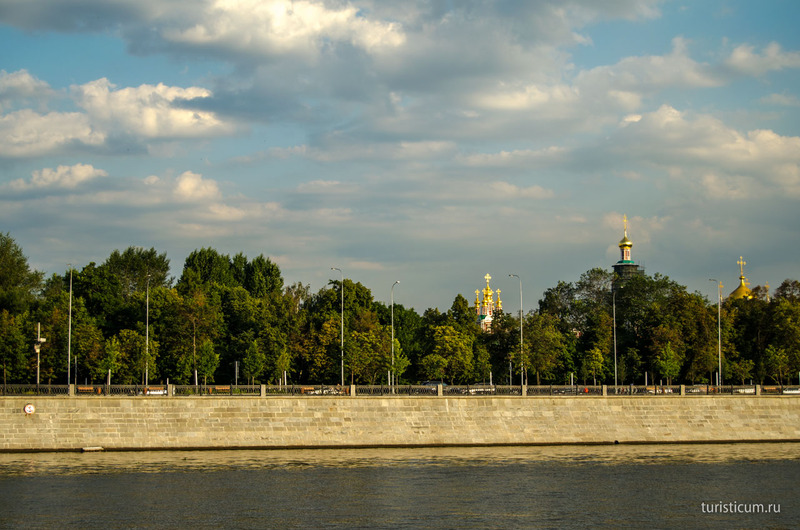 If we turn back we will see improved Pushkinskaya Embankment on the left by the Neskuchny Garden. 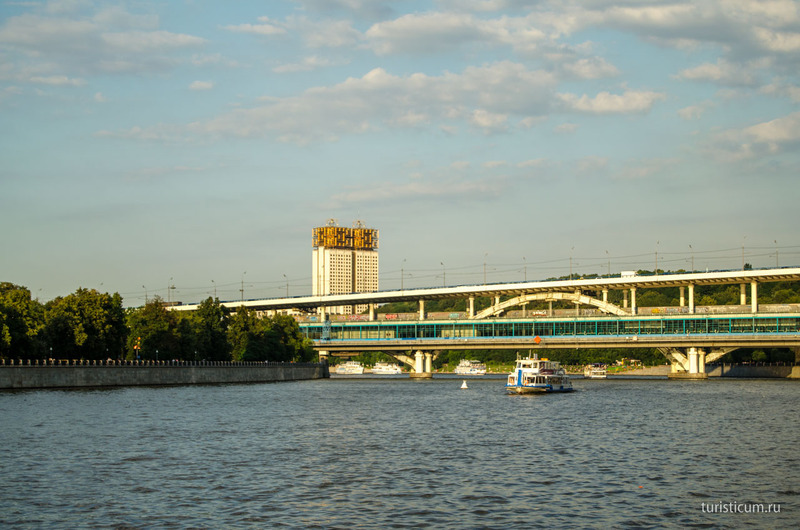 We passed under the Pushkin Bridge and left behind Pushkinskaya embankment, the First Channel summer studio, Olive beach – a beach zone covered with wood – and Rotunda. There is the embankment tribune of Gorky Park ahead of us. 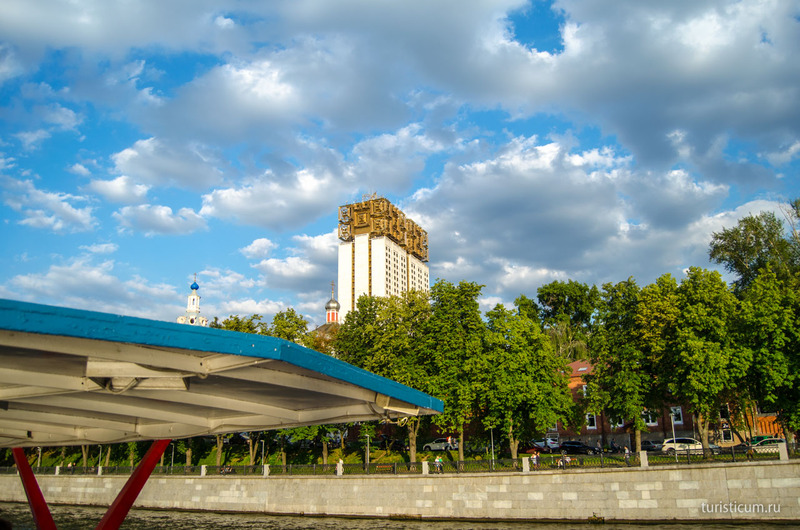 It was built in 1934 to observe spot competitions on the Moskva river. Now it has entirely decorative function. And there is another bridge ahead – Crimean Bridge. It is a part of the Garden Ring Road as well as the first pendant bridge in Moscow. We have gradually approached the spit of Bolotny Island – it is the most widely spread name of the island which does not have an official name. The spit is decorated with the most enormous monument created by Zurab Tsereteli – Monument to Peter I. 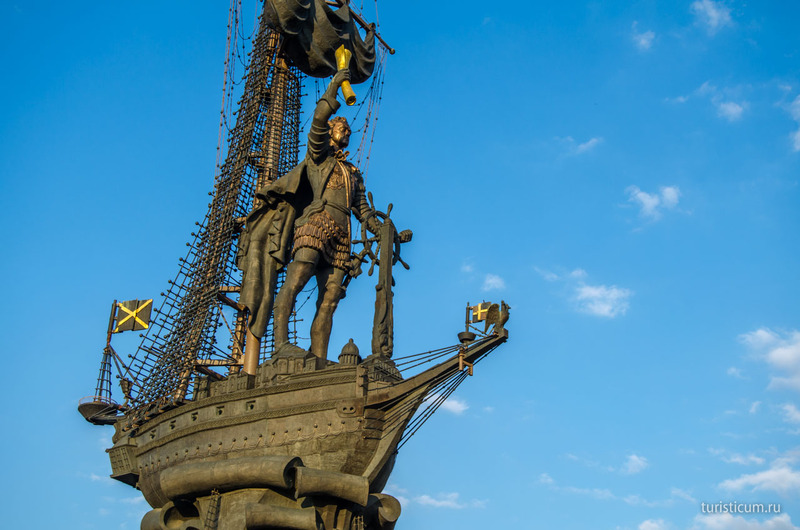 The official name of the monument is “In Commemoration of 300th Anniversary of Russian Fleet”. It occupies its place since 1997. Its height is 98 meters (321.5 feet) which is more than that of «Mother Motherland Calls!» in Volgograd and only a little bit less than that of the “Conquerors of Space” at VDNKh. 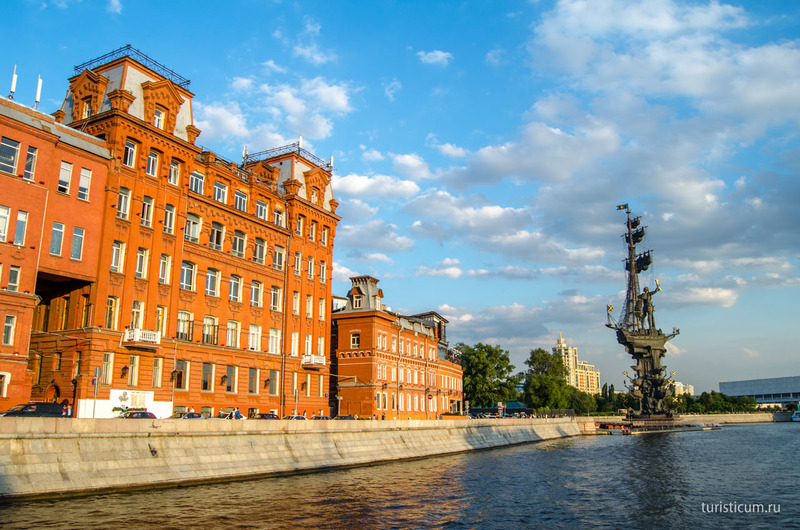 The legendary Krasny Oktyabr factory is also situated at the spit of Bolotny Island right behind the Monument to Peter the Great. A German citizen Theodor Einem founded a small candy workshop in Arbat in 1850. His companion was Juliy Geis. Together they earned a fortune supplying Russian Army with syrups and jams during the Crimean War. 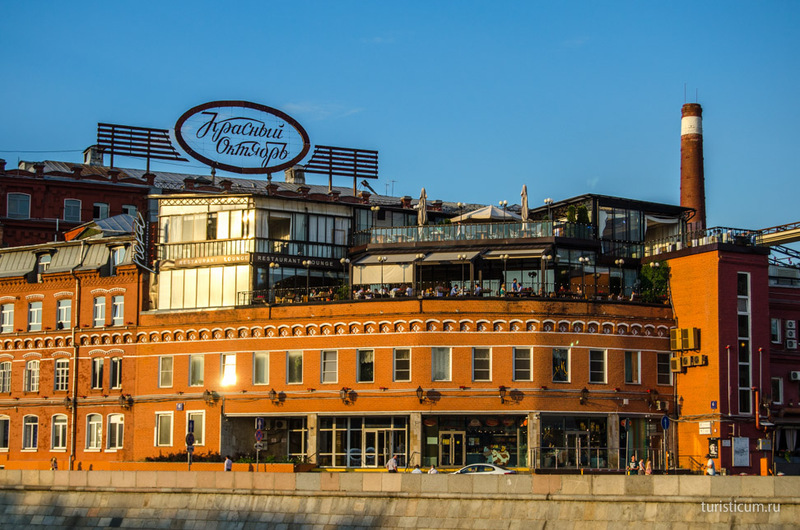 This money allowed them to build the workshop building at Sophiyskaya embankment, just in front of the Kremlin. 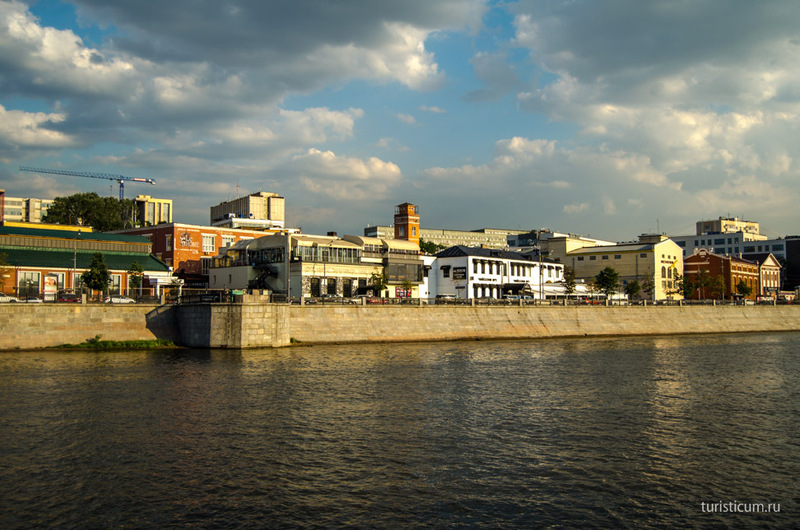 A new, bigger building with roomy shops, business offices and skywalks between bulks was built at Bolotny Island. 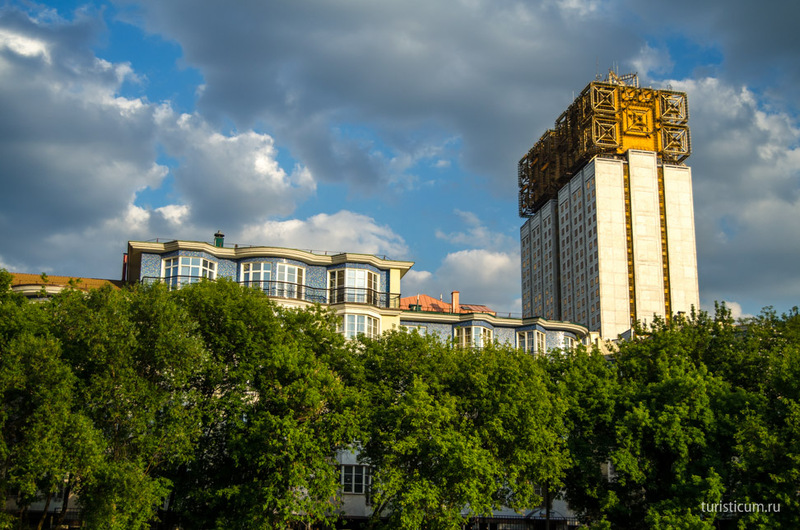 This is the building widely known as Krasny Oktyabr. The Einem factory acquired its present name in 1918 after the revolution and nationalization. Today the production itself is organized in another place and the factory building homes art studios, offices and restaurants. We sail by Patriarchy Bridge. 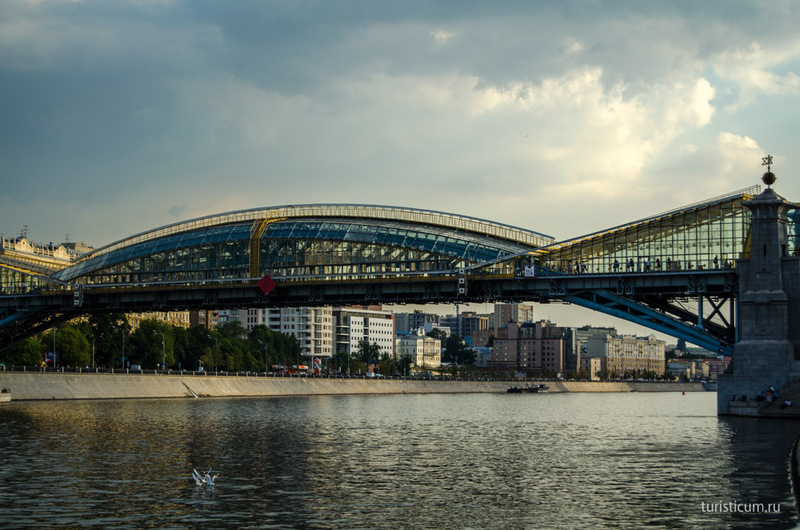 It is a pedestrian bridge which both completes the architectural composition and performs the function of the front entrance to the Cathedral of Christ and Savior. 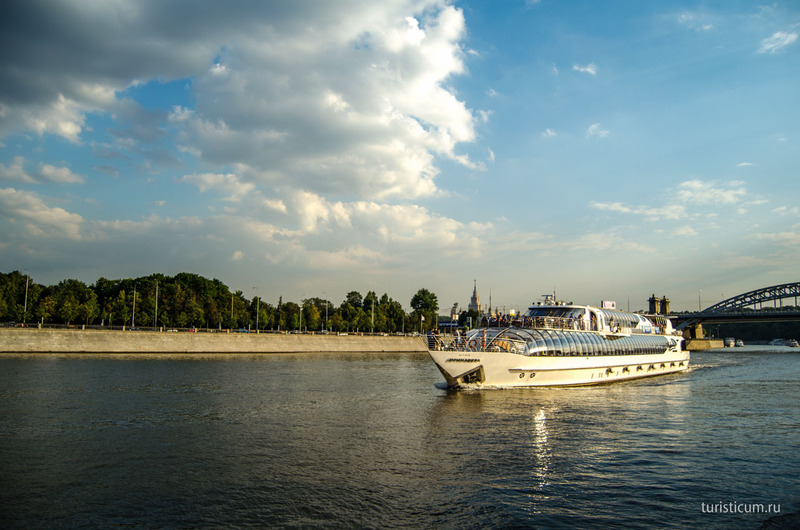 Our ship sails under Bolshoi Kamenny Bridge and along the main embankment of the capital – The Kremlin embankment. 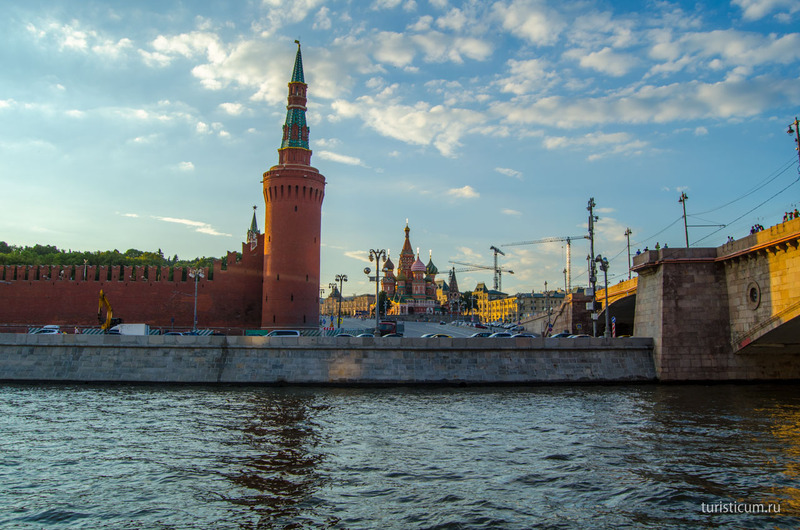 Views on our left are well known to every citizen of the country, including those who have never visited Moscow yet. 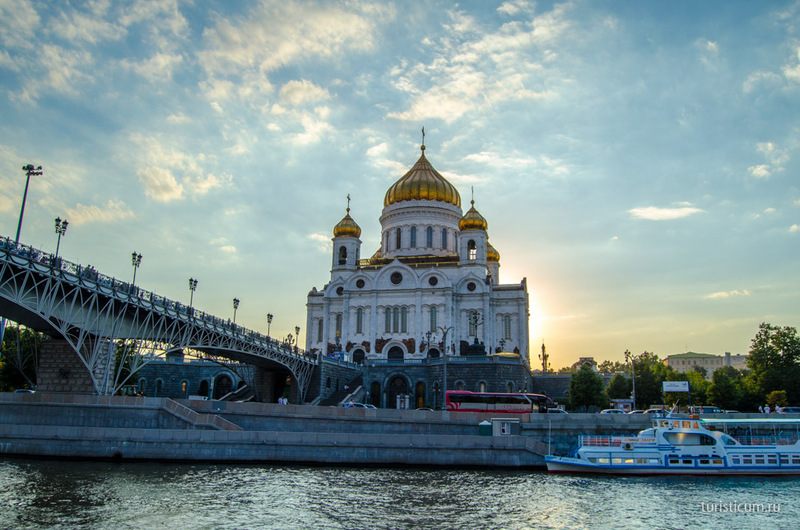 The Cathedral of the Intercession of the Most Holy Theotokos on the Moat also known as the Saint Bazil’s Cathedral is seen in a little space between the wall of the Moscow Kremlin and Moskvoretsky Bridge. There are also plenty of construction cranes here. 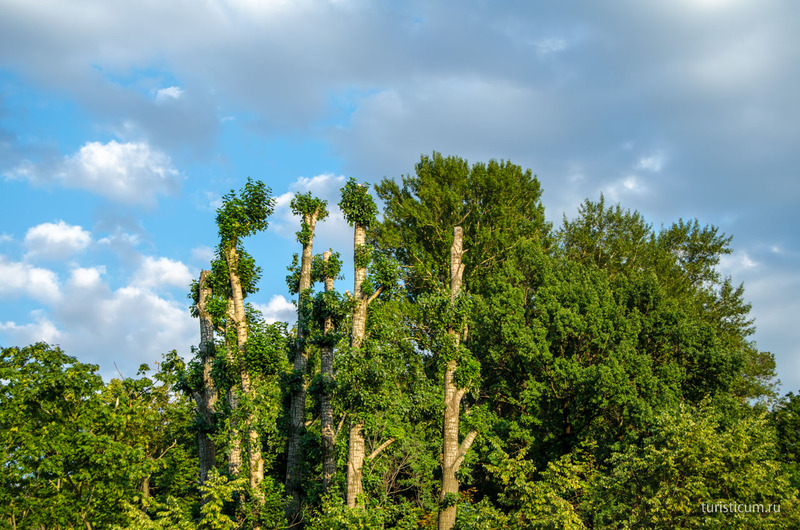 We have to tolerate the inconvenience of such view because soon enough a new park “Zaryadye” will appear on their place. This is Bolshoi Ustinsky Bridge in front of us. 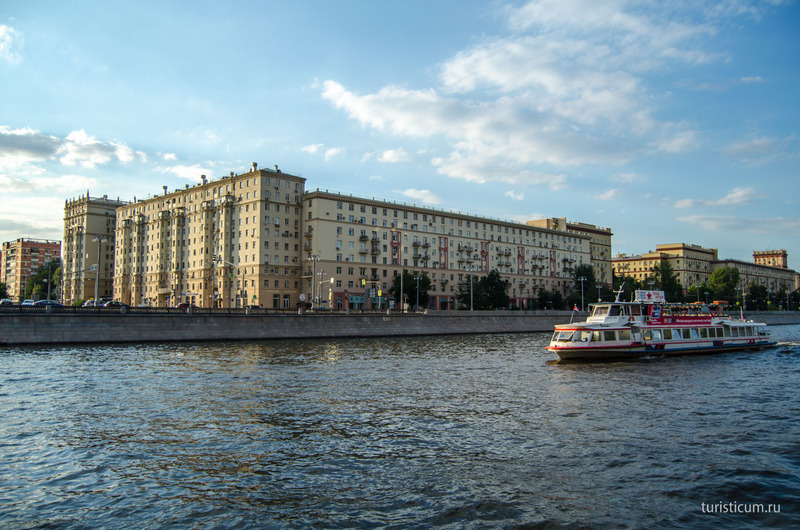 One of the famous Stalin’s high-rises at Kotelnicheskaya embankment is right behind the bridge. We sailed round Bolotny Island and appeared at another spit. We docked to the pier by Novospassky Bridge. There is Novospassky Stavropegic Fratry and a pound nearby the pier. Just in case if you still lack attractions and want to admire some. Today we walked three quarters in the direction of Krutitsky lane we came to “Proletarskaya” metro station. We easily got to our hotel from here. 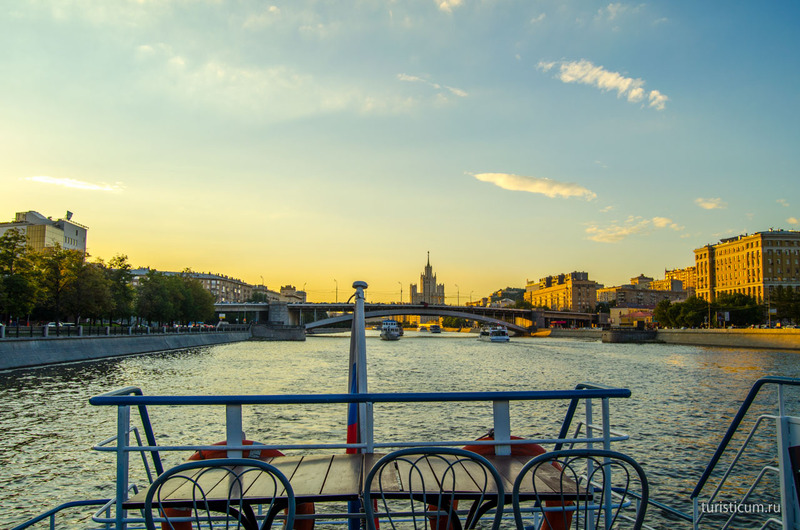 We hope that you have enjoyed the excursion along the Moskva river because we really had. Nice weather, sunset, beautiful city and numerous attractions won our hearts and awoken the wish to know them better. 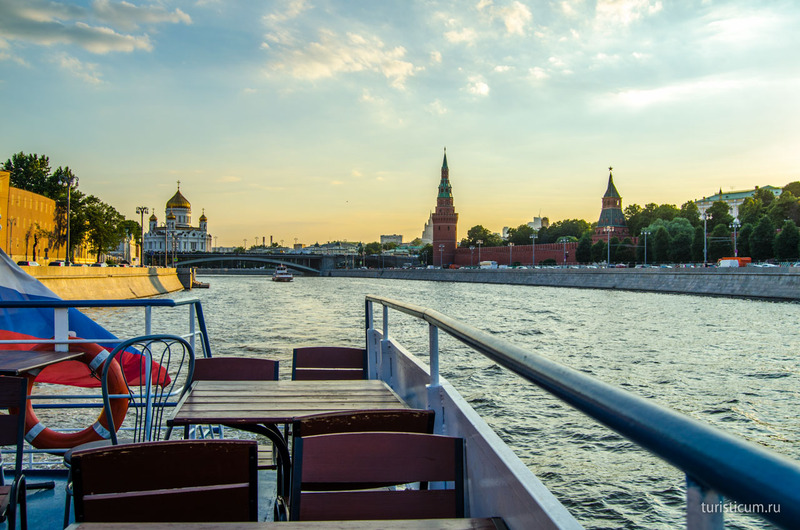 Many people come to Moscow to live and work, but we would rather recommend visiting the touristic Moscow which will never disappoint you.